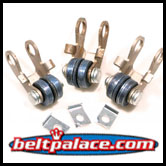 Comet 300148A - 72 Gram Roller Weight Kit for 780/500 Series Comet Industries Drive Clutch. Comet Industries 300148-A. Comet Industries 300148A ROLLER WEIGHT & ARM ASSEMBLY. Home > Comet Clutches and Parts > Comet 301768A Driven Clutch. Replaces Salsbury 500 Driven 301768 > Comet 300148A - 72 Gram Roller Weight Kit for 780/500 Series Comet Industries Drive Clutch. Comet 300148A - 72 Gram Roller Weight Kit for 500 Series Comet Industries Drive Clutch. Comet Industries 300148-A. 72 gram roller weight kit. Comet 780/500 Drive Clutch Mod kit 300148-A. 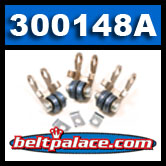 300148A: For use with Comet 780/500 Series Centrifugal Clutch drive systems. See Also: Comet 500 Series Drive Clutch. 1" Bore. Genuine Comet 300148A Roller Weight Kit (72 Grams) made in USA by Comet Industries.